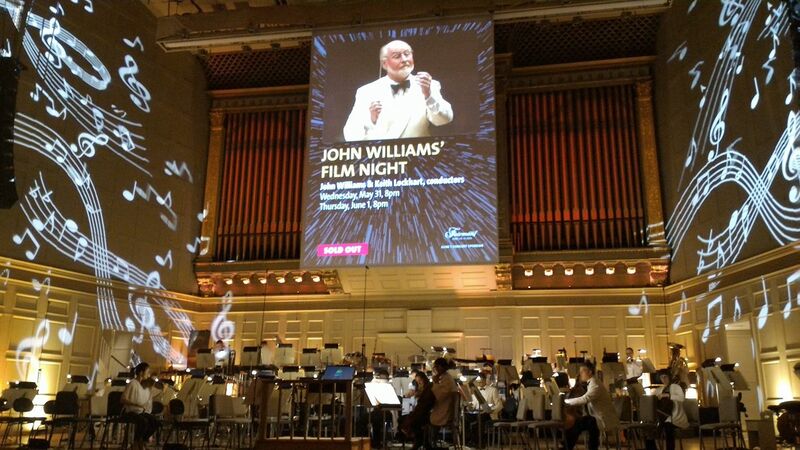 John Williams’ Film Night. 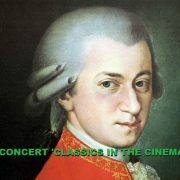 Those four words should be enough to draw the attention of any fan of film music. 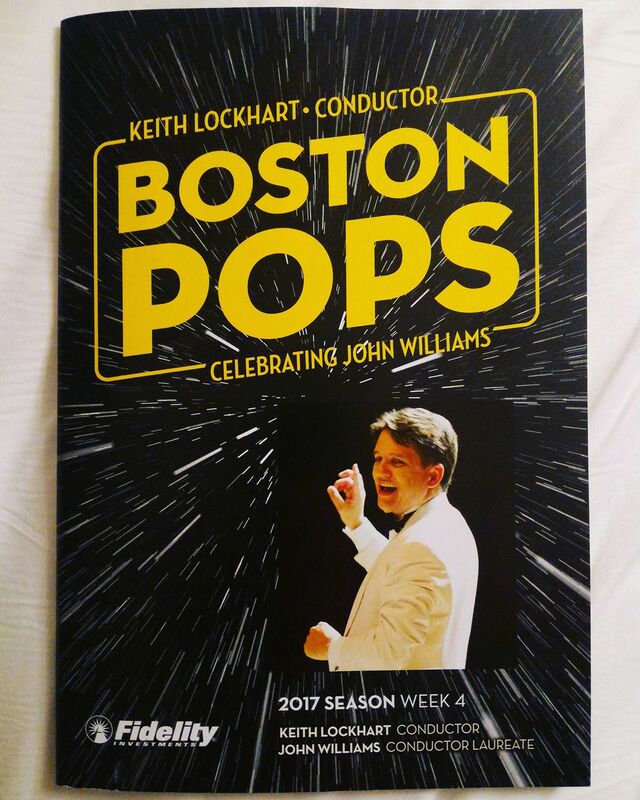 And if you add the bonus of having Keith Lockhart and John Williams himself conducting that concert, then we have a deal! This annual event held in Boston in May with the Boston Pops orchestra, an orchestra that has been playing Williams’ music for so many years, is a gift that the maestro gives to his fans every year, showing his love for music and the wish to share it with audiences of all ages. 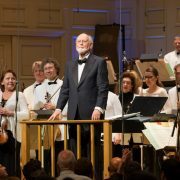 This February John Williams turned 85 years old and Boston Pops has celebrated that with a special program led by Keith Lockhart that featured ET and Jaws in concert this month of May, a concert called “Celebrating John Williams!” in April with some rarities from Williams’ career, and a special concert called “Lights! Camera! Music! The Magic of John Williams” just one week ago. So in a way, the concert we were going to enjoy tonight (Wednesday 31 of May 2017) was the top of the iceberg of all the “small” celebrations that followed the previous months. 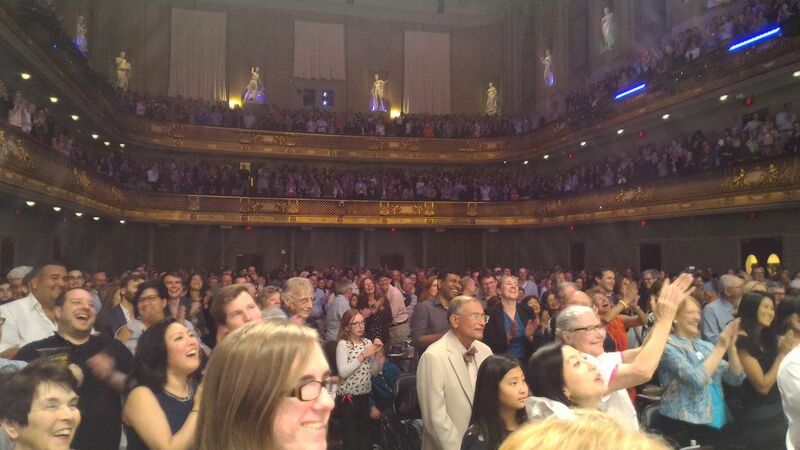 With a Boston Symphony Hall completely full, the concert started at 8:00 p.m. with Keith Lockhart appearing on stage with an audience clapping and cheering in a prelude of what was to come. The first half of the concert was conducted by Lockhart, who started warming the ambience with Pops on the March theme, with a solemn and patriotic tone and that was flawlessly performed. Before going to the next piece, he took the microphone and talked to the audience introducing the concert and telling how the initial idea was to do a concert as in previous years, with themes from John Williams’ movies and themes from other famous Hollywood movies. But that was changed later as he though, “Hey John, it’s your 85th birthday celebration! You should have a whole concert for yourself!!”. A statement that was pretty well received by the audience with a big applause. Next we had the opportunity to enjoy Main Title – The Towering Inferno, a theme not very usual for a concert, and a theme that even being more than 40 years old, still kept the freshness with the tension and the surprise tone that is associated to a disaster movie. 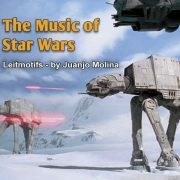 This theme has been played recently in “Celebrating John Williams!” concert, from which a fantastic CD was released “Lights, Camera, Music! 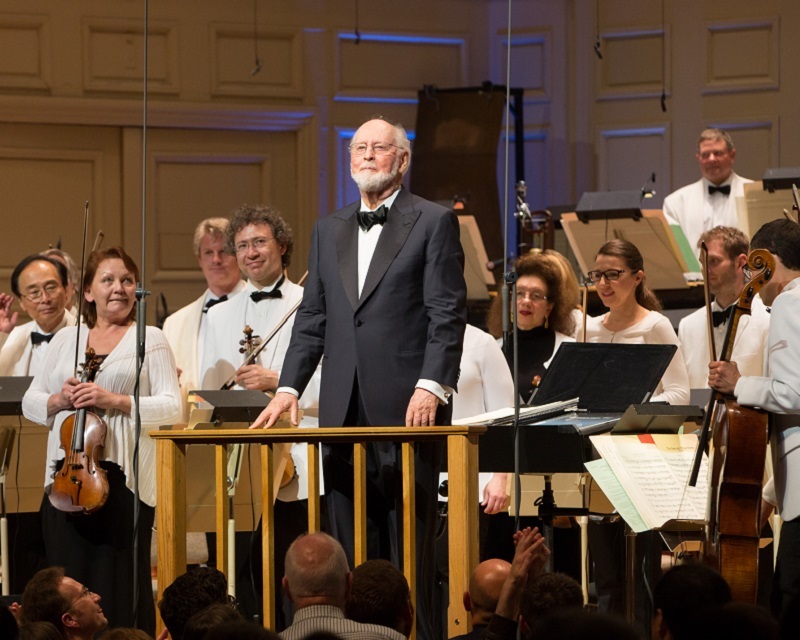 Six Decades of John Williams” on sale in the Boston Symphony Orchestra’s Shop. Jumping to the next piece, Lochkart introduced Stargazers – E.T. – The Extra Terrestrial with Jessica Zhou performing the harp, in a version that had delightful and soft orchestrations, with the harp leading the melody in the first three minutes, to get later the wrapping and thrust of the orchestra till the end of the theme, that lasted around 8 minutes in total. Then another special piece was played, rarely performed in concert, Devil’s Dance – The Witches of Eastwick, with strength, character, funny, rhythmic, and with an agile and fast development, carefully supervised by Keith Lockhart who gave precise instructions to the orchestra while conducting with his bare hands. Fantastic performance! And now, one of the highlights of the concert arrived, Theme – JFK with Thomas Rolfs playing the trumpet, in a solo beginning that gave goosebumps with waves of sensitivity, weeping and lament, but also delivered hope and greatness. Amazing performance and big applause of the audience at the end! The screens that had been hidden until that moment came down to mark the beginning of The Duel – The Adventures of Tintin, a fast and funny theme, that was perfectly complemented by the projection of images of all kind of duels that could be found in the history of cinema (from pirate movies, to Indiana Jones and lightsaber duels in Star Wars). Orchestra and images were completely synchronized, ending in the same exact second, giving an idea of the understanding that Keith Lockhart and the orchestra had achieved. Arriving to the last pieces of the first part, Viktor’s Tale – The Terminal was played, with a funny and fast eastern European sound, led by Thomas Martin playing the clarinet, depicting the troubles and situations Tom Hanks had to go through in the movie. Screens came down again to visually enhance Harry’s Wondrous World – Harry Potter, which in five minutes delivered a colorful and playful tone that captivated the attention from the audience. And just before getting to the intermission, Superman March was played, a wonderful, strong, energetic and powerful theme, while images from many of John Williams’ movies were projected in the screens, showing us undoubtedly that John Williams is the Superman of film music. With all our batteries charged in a fantastic first half of the concert that lasted one hour, we arrived to the intermission. 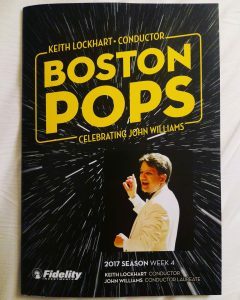 During the intermission I had the chance to perform a short interview with Keith Lockhart in exclusive for SoundTrackFest, interview that will be published in the following days, but now I’d like to highlight one idea that Keith said regarding the concert that will be played next 4th of July: “Boston Pops Fireworks Spectacular” (read news here). 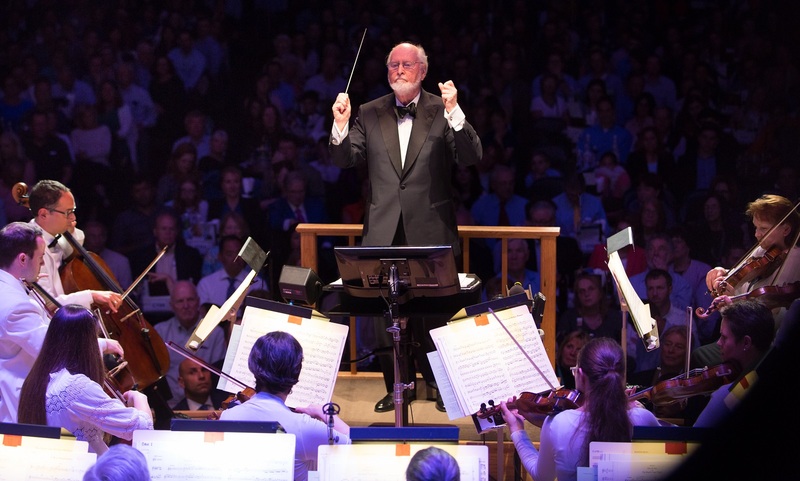 Continuing with the concert, the second part started with John Williams appearing on stage with a loud ovation from the public. 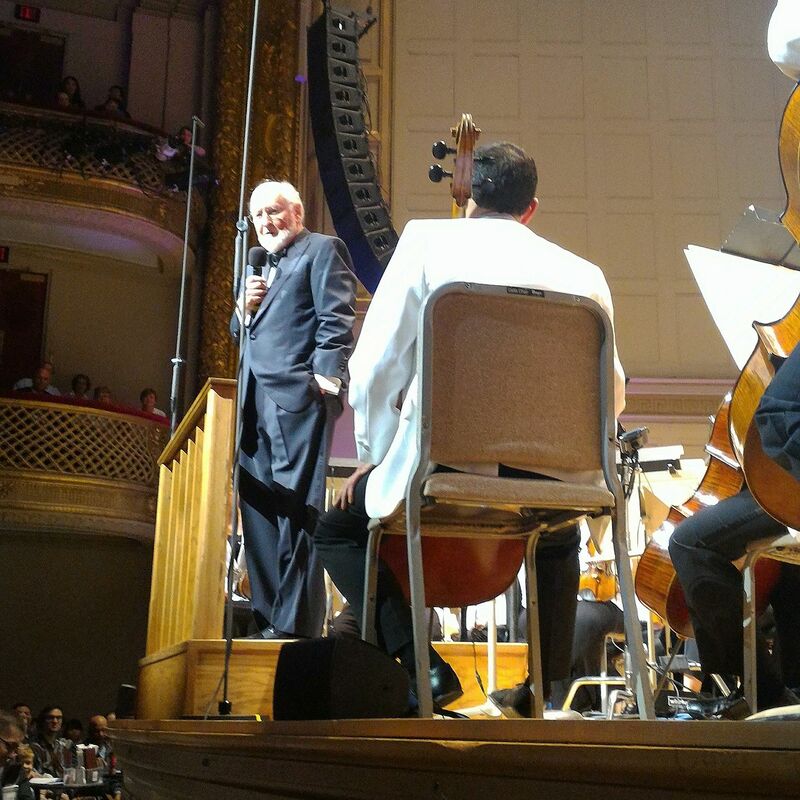 He smiled to the audience, thanked, and turned to the orchestra to start with a suite called Hooray for Hollywood (with arrangements from John Williams) that had images from many classic Hollywood movies in a frantic, joyful and fast developed piece. 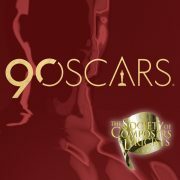 A real celebration of movies, full of fun and enjoyment. Having the opportunity to watch John Williams conduct is an incredible experience, especially if you’re close enough. You can see in his face how he looks into the musician’s eyes, to give exact instructions on how to perform or how to attack a specific section of a piece. He was conducting not only with the baton, which kept the rhythm and the pace all the time, but with the expression of his hands and with his looks and even the raising of his eyebrows. It’s incredible the strength and stamina an 85 year old man can have. But there’s a reason behind that: doing what you love most, conduct your music live in front of a committed audience. Back to the concert, and after that piece, A Child’s Tale – Suite from BFG was played, soft, melodic and sensitive, leading way to a brief pause that gave Williams the chance to take the microphone and thank the audience and mainly Keith Lockhart, for all the concerts he’s been conducting with his music in the last months, specially Jaws, that as he was told, had a fantastic reception. And talking about Jaws, a film from 1975 with more than 40 years now, Williams recalled how a young Steven Spielberg, 28 years old at the moment, had to deal with so many problems to create such a masterpiece. A masterpiece that had an equal and equivalent masterpiece soundtrack, winner of an Oscar. After the introduction, the themes Out to Sea / Shark Cage Fugue – Jaws were played and that even they don’t have the famous tune that is already in everybody’s minds, they were perfectly performed. Next A New Beginning – Minority Report came, a piece not very often performed in concert with a good development, giving way to a block from Star Wars that was introduced by John Williams. 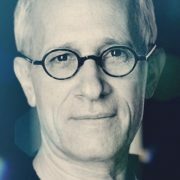 He said how he’s been working on Episode VIII this year, which will come out next December, and how when he was approached to work on the music of episode VII, he had no doubt in his answer: YES. He also said that he fell in love with Daisy Ridley and her performance in the movie as Rey, and that in fact Rey’s theme is Daisy’s theme for him. After the explanation, baton in hand, John Williams started with Scherzo for X-Wing – Star Wars: The Force Awakens, energetic and resilient, to follow with Rey’s Theme – Star Wars: The Force Awakens beginning soft and developing curious and defiant, dealing with the strong nature of the character, to end with March of the Resistance – Star Wars: The Force Awakens that put a wonderful and powerful end to this part of the concert. 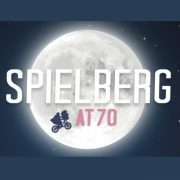 Next a six minute fantastic suite was performed, while images of several movies were projected in the screens, in a Tribute to George Lucas and Steven Spielberg with music from Jaws – Star Wars – Raiders of the Lost Ark – E.T. 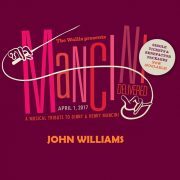 that got the audience clapping at each segment, with the orchestra totally committed under the careful and precise supervision of Williams’ conducting. A masterpiece! 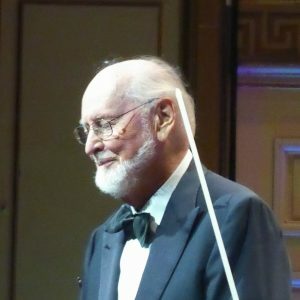 The concert had officially ended but the audience didn’t want that to happen, so after a big applause and cheering, John Williams came back on stage. He took the microphone and said how he recently performed a tribute to Carrie Fisher in the Star Wars Celebration Orlando. Carrie was very close to his daughter Jennifer, as both were the same age and were raised with a close relation and maintained a friendship during the years. So with that emotional charge on the baton, Williams started conducting Princess Leia’s Theme – Star Wars IV: A new hope, that had a soft beginning and a perfect French horn performance, in an excellent piece that had some small flaws from the concertmaster, but that nevertheless delivered a wonderful and sensitive performance. People stood up and asked for more, and John Williams delivered! He started to conduct the first notes of 1941 – March, a dynamic, happy and cheerful piece, where you could see Williams himself enjoying and smiling while he was conducting. During the performance he looked to his right side, into the audience, and encouraged people to clap to the rhythm of the music, which of course we did. After all, who are we to say no to John Williams? With a fabulous sense of celebration that made the audience part of the night, a massive standing ovation happened after the performance. The audience cheered and clapped thinking the night was over… but it wasn’t! John Williams returned for a final encore: The Imperial March – Star Wars V: The Empire Strikes Back, which was received with a big applause by an excited public, that enjoyed the final piece in the same way you enjoy a dessert after a fantastic meal. Incredible finale!! In summary: a wonderful concert with a perfect performance from the Boston Pops, an excellent sound delivered by the great acoustics of the Symphony Hall, with a top level conducting both from Keith Lockhart and John Williams, and with a very well balanced program; between old and rare pieces and new and popular themes, giving something to remember to everybody. A night to keep in the memory, for a long time!